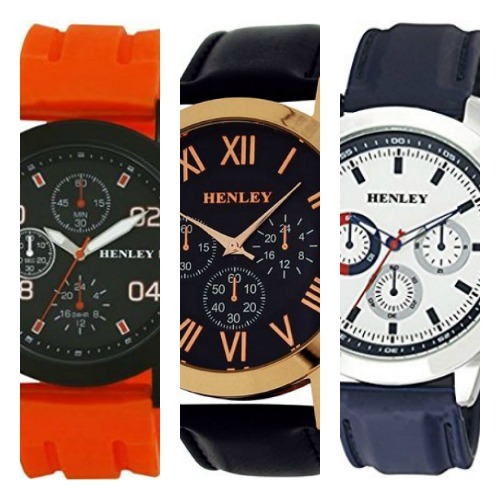 Hey everyone, today we’re taking a look at a very affordable watch brand, Henley. 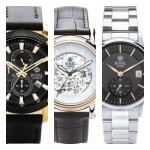 This brand produces a large range of affordable fashion timepieces in a variety of styles and designs. 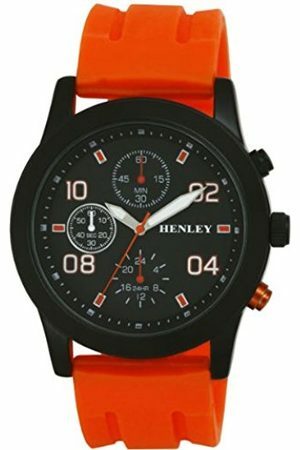 Are Henley watches any good? But are Henley watches actually any good? Personally, I’m not a huge fan of the brand, that’s not to say they don’t have their place in the industry. If you’re after a fun decorative fashion watch that won’t cost you much at all, then they’re perfect. I just personally don’t agree with decorative chronograph dials that don’t actually function, when you consider you could get a working chronograph for not much extra at all. 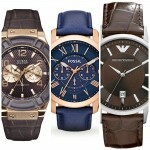 I’d recommend reading my list of the 100 best watches for under £100 for more impressive affordable watches. 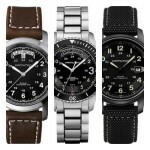 Below I’ve featured five of the top Henley watches currently available. If you have any questions about any of the watches featured below just comment at the end and I’ll try and help you out as soon as I can. 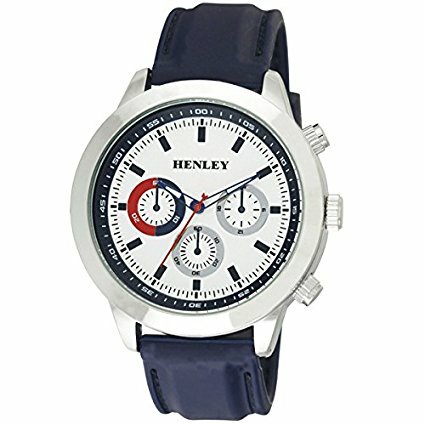 First up on today’s list of the top Henley watches for men is this affordable fashion timepiece. The casing is made from stainless steel and has been paired up with a silicone strap that fastens with a buckle style clasp. The dial contains decorative mini sub dials to give the watch this sporty look. They’ve gone for small blue coloured hour markers along with hollowed out hands. I like the added dash of colour with the red seconds hand. Powering this Henley watch is Japanese quartz movement for reliable timekeeping. A mineral crystal glass protects the dial from scratches and shattering. You can read my full H0210216 Henley watches review here soon. Up next on this list of top Henley watches is this oversized dual display sports timepiece. 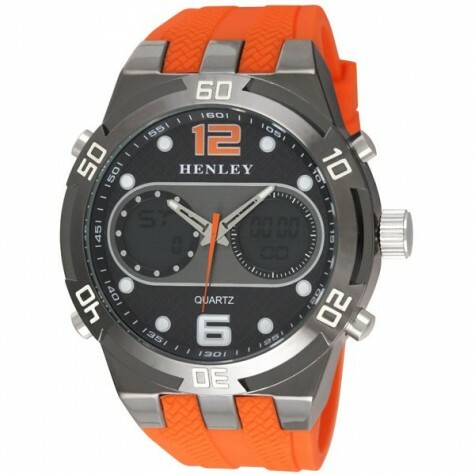 It features a large stainless steel casing with a vibrant orange silicone strap. The dial has a dual analogue digital display. The 12 digital LCD display can show hour, minute, second, month, day & week information. Features include an hourly chime, 12/24 hour format, 1/1000 second chronograph with split functions. At the heart of this timepiece is a quartz movement for reliable timekeeping. A mineral crystal glass has been specially hardened to offer better protection from scratches and shattering. You can read my full HDG033 Henley watches review here soon. Here we have another popular oversized Henley watch. This timepiece is built with a large 55mm casing that has a thickness of 17mm making it quite a chunky watch. The strap is made of rubber and fastens with a buckle style clasp. The dial features bold hour markers and hands as well as four small digital displays. The hands of the watch feature a coating of lume for better visibility in dim lit conditions. The watch also comes with a useful alarm function. A quartz movement powers the watch making it accurate and reliable. Protecting the front of the watch is a mineral crystal glass for a good level of scratch and shatter resistance. You can read my full HDG031 Henley watches review here soon. 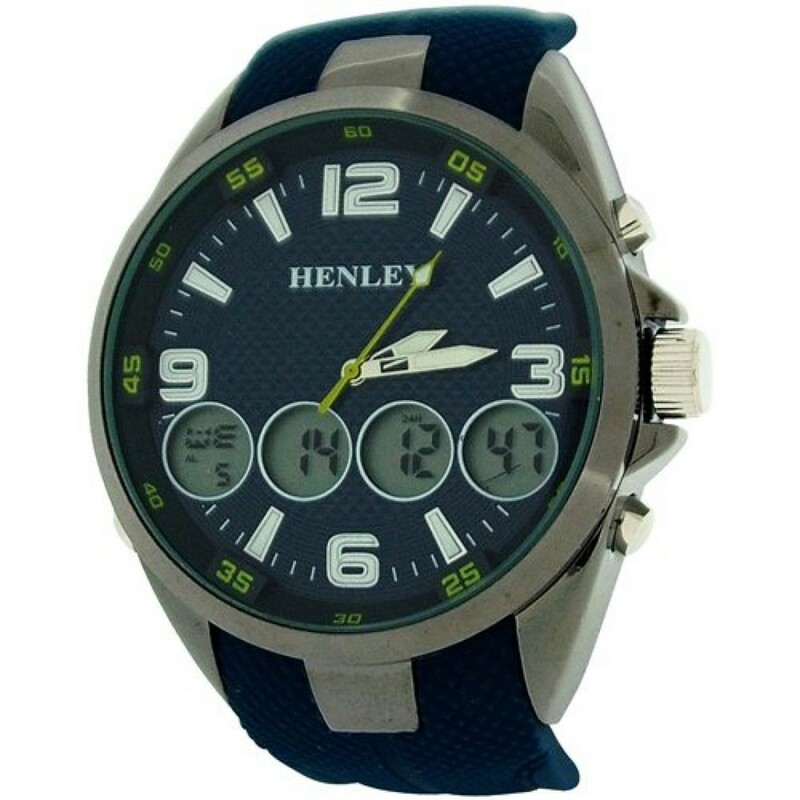 In at number four we have another vibrant timepiece from Henley watches. The black coloured casing of this timepiece is approximately 40mm in diameter and has a slim 8mm depth. The orange coloured strap is 17mm in width and fastens with a buckle style clasp. The dial features a decorative multi dial design, note that this is not a functioning chronograph. This dial does have a relatively easy to read design with the white hands standing out well against the black background. A quartz movement powers this men’s Henley watch and gives you reliable and accurate timekeeping. Protecting the dial is a specially hardened mineral crystal glass for a good level of scratch and shatter resistance. You can read my full H02071 Henley watches review here soon. 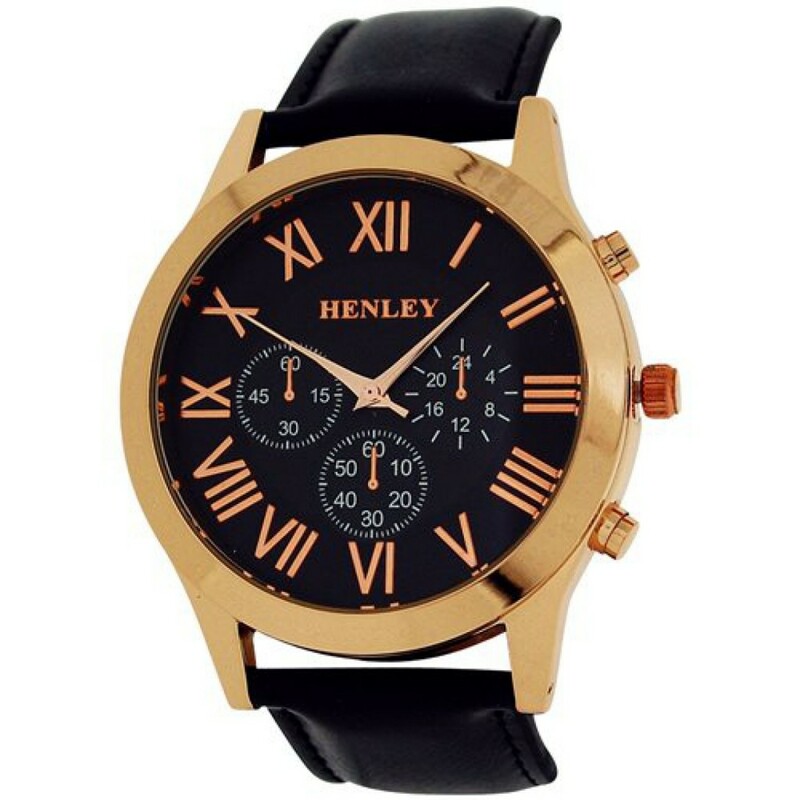 Last up on today’s list of popular Henley watches is this smart looking men’s timepiece. The casing has been plated with a gold colouring and has a diameter of 49mm with a 12mm thickness. The strap is made from a PU leather and fastens with a buckle style clasp. The dial features 3 chronograph effect decorative sub dials, note again these are not functioning. I do like the combination of gold coloured Roman numeral style hour markers and hands against the black background. This men’s Henley watch is powered by a quartz movement for reliable and accurate timekeeping. A mineral crystal glass has been specially hardened to offer extra resistance to shattering and scratches. You can read my full H02092 Henley watches review here soon. Thanks for taking the time to read through today’s Henley watches review. What was your favourite model? Comment below and let me know.